Simulation – You have to use signs to say anything at all in language. Truth, lies, and simulacra all require signs. In truth, a sign refers to a thing. “Apple” means a shiny red fruit. 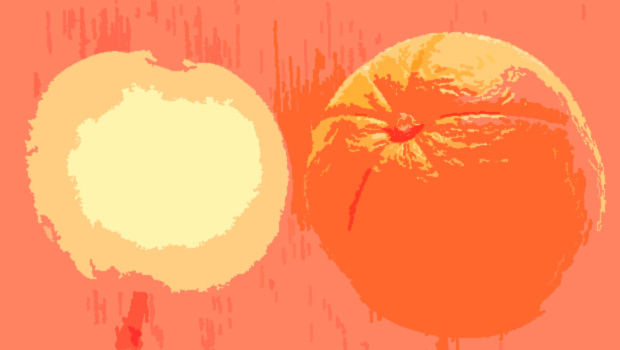 An example of a lie or dissimulation would be telling a Japanese tourist that the sign “apple” (whether the written word or the sound) refers to an orange spherical fruit. I have given a “real” sign a “fake” meaning. Simulation is different. When the soldier lies about being ill, he has no signs of illness. He is lying. When he simulates being ill, he produces the signs of illness in himself (have you ever worried yourself sick, for example?). No doctor can distinguish between a soldier who is simulating being sick and who is “really” sick. Or take Baudrillard’s example of the bank robbery. What does it mean to “simulate” a bank robbery? If you go into a bank and pull a gun on the teller, even if you are not going to take any money from the bank, no outside observer can tell if you’re “lying” about robbing the bank or not: You are in fact robbing the bank. You have successfully simulated a bank robbery. To tell the truth means to talk about something “real.” Apple means apple. To dissimulate or lie means to cover over a real truth with a falsehood—to fake the truth. Apple “means” orange. To simulate, however, means to fake a truth. Apple refers to a shiny red thing that never existed. But we can’t tell the difference, when you say apple, between the truth and the simulation. We can uncover a lie. We cannot uncover a simulation. Baudrillard gives the great example of Disneyland. Disneyland exists as a “truth” about America, a “real way America used to be,” that has no truth in history. It’s not a lie about something that exists; it’s something “true,” to us, that fulfills a certain truth function, and is not a “lie” in the sense that it does not start with an apple and lie about an apple; it starts with a fake apple. A lie-apple. And tells the truth: It’s all make-believe. Watergate is another great example. Did truth and justice “win,” or was the entire cycle a simulation to reaffirm, however desperately, that truth and justice can happen? Baudrillard gives several really good examples, but it’s a heady issue. Essentially, he accuses all of modern life of being wrapped up in simulation, at this point, instead of truth and lies. It’s dangerous, if true, because truth and lie don’t matter. Think about politics. Do you believe the politicians are telling you the “truth” or “lying” to you? Or fulfilling a function that enables them to remain politicians, one essentially divorced from the truth?